A materials scientist at DOE's Pacific Northwest National Laboratory has been elected to the rank of Fellow of the American Physical Society. Dr. Scott Chambers is a Laboratory Fellow and leads a research team focused on the properties of "designer" oxides -- materials which combine different metal atoms with oxygen atoms into solid materials. Oxides have wide-ranging properties, making them useful for electronic and magnetic technologies, as well as for photocatalysts, which use light to speed up chemical reactions. Chambers is widely recognized as an international expert in the synthesis and properties of crystalline oxides prepared as thin films. His research focuses on the fundamental relationships between composition, structure, and functional properties. Understanding these relationships enables new applications of these materials in several technological areas. APS is a non-profit membership organization working to advance and diffuse the knowledge of physics through its research journals, scientific meetings, and education, outreach, advocacy, and international activities. APS has more than 51,000 members in academia, national laboratories, and industry in the United States and throughout the world. Chambers earned a bachelor's degree in chemistry and chemical physics from the University of California at San Diego and a doctorate in physical chemistry from Oregon State University. No more than one-half of one percent of the membership may be elected an APS Fellow each year. 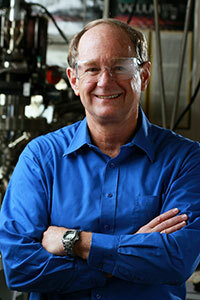 Chambers' selection brings the total of current PNNL staff members who are APS Fellows to 14. He will be recognized with the rest of this year's class at the organization's annual meeting in Baltimore in March 2016.